Anchorage International Airport, with the Chugach Mountains in the background, is the first Alaska scene many visitors see from ground level. The snow wasn't off the mountains yet in late winter when the above picture was taken. Alaskans make the most of summer's long days and mild temperatures while they last. The reappearance of snow high on the mountain slopes in early September is referred to as "termination dust," signalling the end of summer. 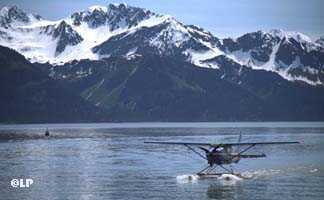 The floatplane, above right, has just landed in Resurrection Bay near Seward. Seward is a deep water port that serves tourists who arrive on cruise ships from the Lower 48 and freighters that carry Alaskan coal to the Far East. 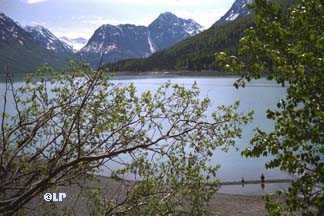 The mountain lake scenes are of Lake Eklutna in the Chugach Mountains east of Anchorage. 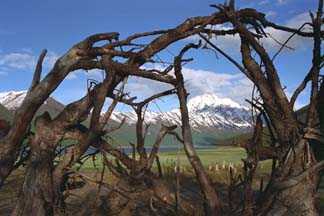 One of the mountains bordering the lake is framed by driftwood in the first picture; a close look at the second reveals two fishermen. A statue of Captain Cook, who sailed these waters 200 years ago in a vain attempt to discover a northwest passage, overlooks Cook Inlet. 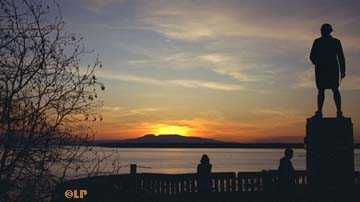 The sun is setting behind Mount Susitna, also known as the sleeping lady. Unusually long sunsets and sunrises in the spring and fall as the sun slides along just above or just below the horizon add to the romance of those short seasons in Southcentral Alaska. Sadie Cove Wilderness Lodge's handcrafted cabins offer a sheltered oasis in Kachemak Bay State Park across the bay from Homer.